It’s that time of year. No, not Christmas just yet, the time of year when everyone switches up their base to something a little more heavy duty. Maybe it’s the chill in the air but autumn/winter is without a doubt the time of year that many opt for full coverage, myself included. And this year, I’ve wasted no time making the switch. If I’m honest though, the main reason I haven’t hung around this year is because of my inner beauty addict. 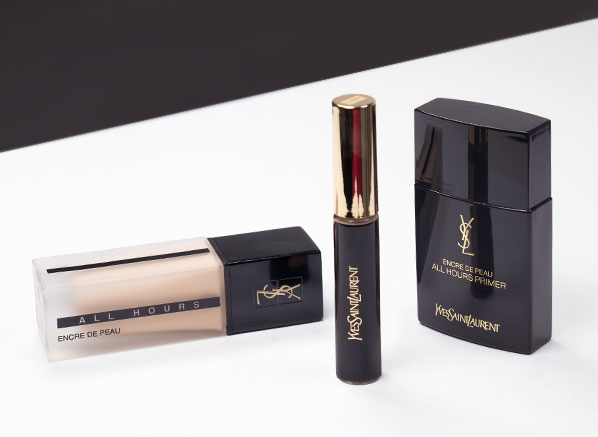 I’ve been too eager to try Yves Saint Laurent All Hours, a full coverage mattifying base collection (including primer, foundation and concealer) that’s just arrived at Escentual. #1 As I mentioned above, the All Hours range includes a primer, foundation and concealer (more on them individually below), so it has everything you need to achieve a unified, perfected complexion. #2 The finish of the collection is matte and the coverage is full (it’s very pigment rich), however, you can achieve a more medium coverage by applying with your fingers or a sponge. #3 It’s made to last! For 24 hours to be exact. Extraordinarily durable, the collection is waterproof, transfer-proof and made with oily skin in mind thanks to its oil-free, non-comedogenic formula. #4 You can pick up the All Hours Concealer in 5 different shades at Escentual, plus shop a line-up of 19 shades in the All Hours Foundation SPF20. #5 Both the primer and foundation have SPF! No, it’s not a rumour that you should be wearing SPF outside of summer, that’s why it’s great that SPF can be ticked off on both accounts here. Prepping your skin is important for any makeup look, but it’s especially important if you want your look to stand the test of time. The Yves Saint Laurent All Hours Primer SPF18 works by mattifying and smoothing the complexion. It does this with oil-control technology that not only reduces the look of pores and imperfections but also improves makeup longevity and adherence, all while limiting shine. The result is silky-looking skin and the perfect base for foundation. My favourite way to apply this primer is with my fingers. It has a very liquid texture, so you only need a very small amount. Once you begin to work it in you’ll notice it disappear into the skin, but don’t be scared by this though, it’s non-comedogenic so you can be sure that it won’t cause you to breakout. If there’s one thing I can assure you, it’s that this foundation means business. It’s made for someone that doesn’t want mediocre makeup. I mean, there’s nothing mediocre about a base that’s waterproof, transfer-resistant, designed to last 24 hours – and did I mention it’s also enriched with a skincare complex and UV filters that offer SPF 20 protection? Yes, there’s definitely nothing average about the All Hours Foundation SPF20. In this case, full coverage doesn’t mean cakey or heavy either. 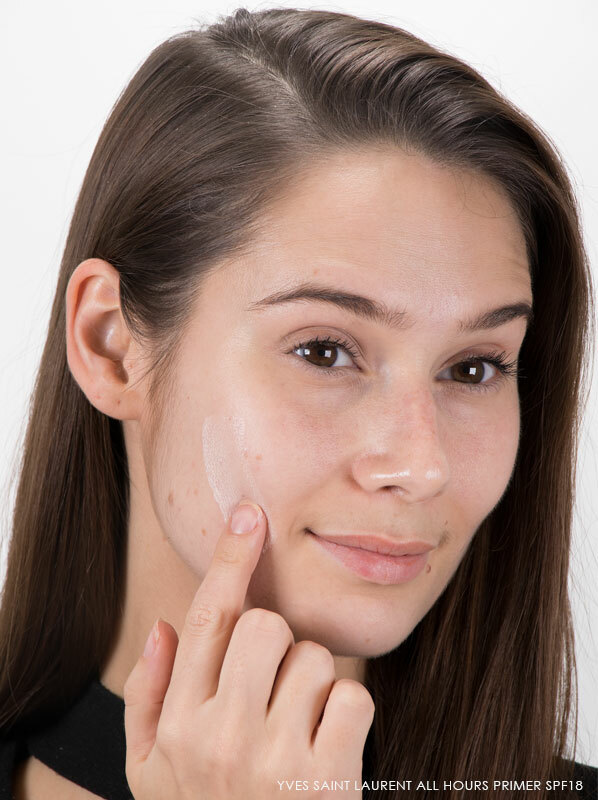 The All Hours Foundation SPF20 is extremely comfortable, offering a matte finish that doesn’t look flat but instead looks natural and flawless. It’s a great foundation that will work for every single skin type, whether you’re oily, normal, dry or a mixture of them all! There’s a number of ways you can apply this foundation too, and each way will alter the finish/coverage you achieve. 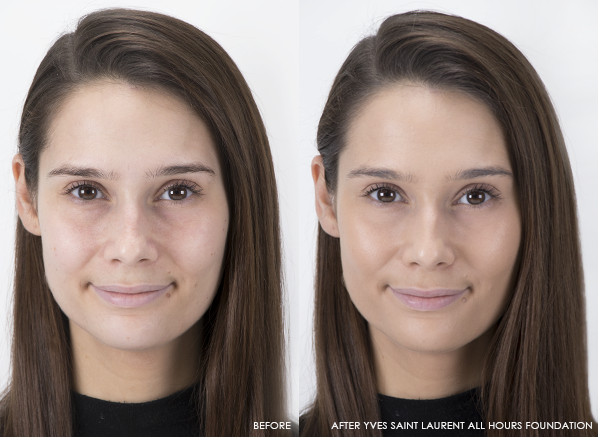 If you want a more natural effect opt for the Yves Saint Laurent Foundation Blender as your tool of choice, or if you’re keen to build coverage choose the Yves Saint Laurent Foundation Y-Brush No5. For the above application, I chose to use the brush so that I could see all that All Hours had to offer. The result? Well, you can see for yourself that my skin was unified, radiant and all blemishes have vanished! A foundation can only do so much, so every full coverage collection needs an equally good concealer to take it to the next level. Luckily, All Hours has even more full coverage power in the form of the All Hours Concealer. This concealer’s velvety, matte texture and flawless finish is the perfect match for the foundation. It helps to give blemishes an extra boost of coverage thanks to its pigment-rich formula, while its creamy texture and brightening quality works amazingly well to erase dark circles. For the best result, it’s best to dot this concealer onto the areas you’d like to camouflage, then blend with the warmth of your finger. Despite its high concentration of pigment, the All Hours Concealer doesn’t feel heavy or look cakey. Instead, it gives your complexion a perfected look that won’t budge, even if there’s tears or torrential rain! This entry was posted on Thursday, November 8th, 2018 at 11:16 am and is filed under Hints & Tips, Make-up, New products, Swatches, Tried & Tested. You can follow any responses to this entry through the RSS 2.0 feed. You can skip to the end and leave a response. Pinging is currently not allowed.